Last week, Jeff Passan wrote about talks between Major League Baseball and the MLBPA. As part of those talks, both sides proposed a series of changes that would alter the way the game works, both on the field and off of it. I was able to identify ten discrete proposals — some of them well-defined, and some of them a little more vague. Still, there was more than enough information to proceed to a polling post, where I gave the entire FanGraphs audience a chance to weigh in. The proposals are out there. Some of them might be scrapped; some of them might be pursued. What do you think about each? Good idea, or a virtual non-starter? Whenever I run a polling project, I never actually specify exactly when the polls close. In part, that’s because most people tend to vote right away. In part, that’s because, once enough votes have rolled in, nothing that happens later on meaningfully changes the results. And in part, that’s because every polling project on FanGraphs is completely inconsequential. There are no stakes. Only opinions. So with all of that said, let’s now take a look at the crowdsourced data. I’ve gathered all the information I needed, and I’ve created a couple of plots. 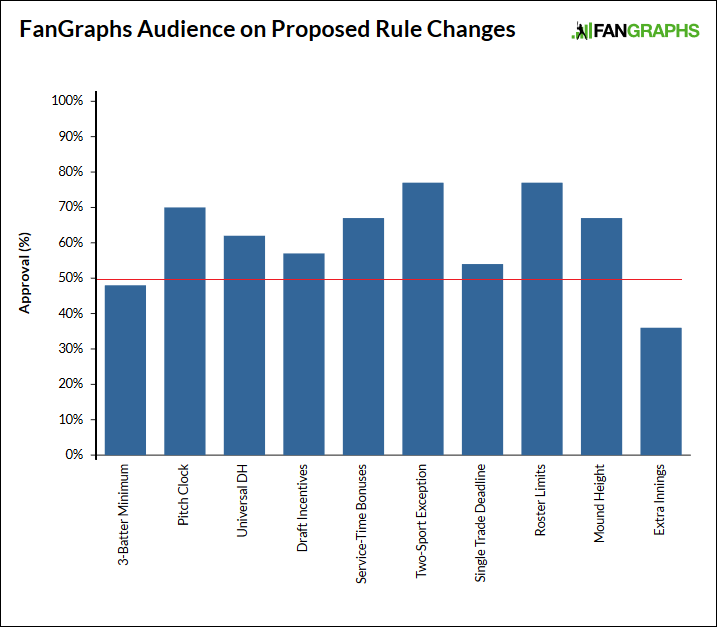 Using 50% as a cutoff, the FanGraphs audience approves of eight of the ten proposals, as understood. If you were looking for a two-thirds supermajority, however, then we’re at four, and very nearly five approvals. That’s still a pretty high number, reflecting either the progressiveness of the FanGraphs readers, or the need for baseball to implement certain adjustments. Probably, it’s both. It’s usually both. There’s only one result below 3.0, and only two results above 3.5. Of the latter, one would make a big immediate difference in the game, and the other would not. In the case of the other, I believe this to be an expression of fear of the slippery slope. For a little further discussion, I’ve broken out the individual proposals and results below. I thank you all for your participation and for your vibrant dialogue below the original post. This proposal called for a three-batter minimum for pitchers, unless they were to get injured or end the inning. 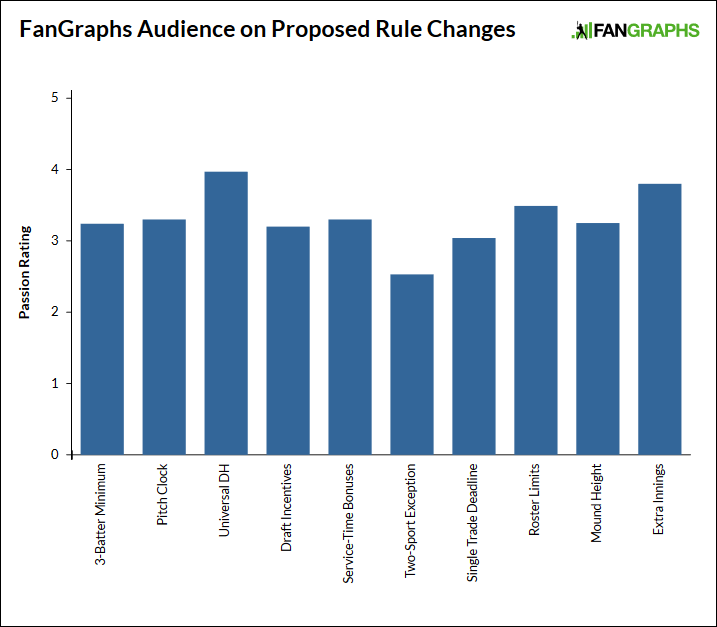 It’s a proposal aimed at reducing the number of mid-inning pitching changes, which can be a drag on the viewers. By a very slight margin, the audience is opposed, with many commenters suggesting a two-batter minimum instead. The rule would have to be written with precision so as not to be open for fake-injury-related abuse. Perhaps an injured pitcher would need to be subsequently placed on the injured list. Or, perhaps no rule at all needs to exist! People here are largely in favor of a pitch clock. Especially a pitch clock that might be turned off with runners on base. Granted, the latter condition might defeat the purpose. I think one reason the audience is in favor is because we’ve been told to expect a pitch clock for years. Many of us have just gotten used to it. It’s used in the minors, and most pitchers say they’re okay with it. Still, some big-league pitchers are opposed for seemingly legitimate reasons, like between-pitches rest. And as one commenter pointed out, catchers might just start to take longer to return a pitched ball to the mound. Nothing in baseball will ever be easy. Bringing the DH to the National League? You might’ve expected this to be 50/50, with AL fans on one side and with NL fans on the other. But either AL fans are overrepresented here, or a chunk of NL fans are willing to go the other way. The fact of the matter is that pitchers are dreadful hitters. The fact of the matter is that pitchers do sometimes get injured trying to hit or run. The fact of the matter is that the DH is used in most baseball leagues in existence. But still, if the DH spread to the NL, there’s presumably no going back. It does change the strategy, and it does mean the end of a specific style of baseball. Unsurprisingly, this proposal finished with the highest Passion Rating. This proposal called for successful low-revenue teams to get draft bonuses, and for teams to receive draft penalties in the event they were unsuccessful two years in a row. The proposal is vague as far as I can tell, so we can’t say much as to the specifics. Still, four in seven FanGraphs readers like the idea of incentivizing winning by way of the draft. It’s far from perfect, but I’m guessing the opinion is that it’s better than nothing. The league has already introduced bonus draft rounds, and draft penalties tied to the CBT. More changes wouldn’t be a stretch. This proposal called for players to be able to earn extra service time should they play well, make the playoffs, or receive award support. Two-thirds of you are on board. In theory, this would allow the best rookies to reach arbitration and free agency sooner. They’d end up getting more money in their better years. But it might also incentivize non-competitive teams to leave talented rookies down longer. Service-time manipulation does unquestionably need to be addressed. This would by no means solve the whole problem. This proposal called for two-sport athletes to be eligible to receive major-league contracts out of the draft. This is a fun set of results — tied for the highest approval, easily the lowest Passion Rating. You all don’t care much, but you’d still like to see the door opened, so that MLB could try to lure more premium athletes. The Passion Rating is presumably low because this would apply to a very small number of draft-eligible players. The timing of the proposal is not coincidental, with Kyler Murray having just today decided to focus on football. Baseball doesn’t want for that to happen. This proposal called for a single, earlier trade deadline. Instead of having one deadline at the end of July and another deadline at the end of August, this would introduce one single deadline, perhaps even before the All-Star break. A problem, I think, is that this is effectively two proposals in one: moving to a single deadline, and moving that deadline up in the calendar. That’s why the approval margin is narrow. My hunch is that people are on board with having just one deadline, but that they don’t want it to be too early, before more teams have a chance to separate themselves in the standings. There’s no guarantee having an earlier trade deadline would do anything to increase activity or incentivize winning. This is another multi-part proposal in one. It called for an expansion to a 26-man roster, but it also set a September roster limit at 28, and it set a non-September pitcher limit at 12. This is tied for the highest approval rate, at seven out of nine FanGraphs readers. It is interesting to consider this along with the proposed universal DH — you’d be expanding the number of hitters, while reducing, by a large margin, the number of normal pinch-hitting opportunities. Say hello to more platoons? The Dodgers would be thrilled. This proposal called for a study of the potential consequences of lowering the mound. As was later reported, it also called for a study of the potential consequences of moving back the mound. Two-thirds of you support the idea, in light of the increasing league-wide strikeout rates and velocities. Of course, it’s easy to support a study when there’s no guarantee of implementation, but then, consider the results from the final proposal below. This proposal called for ending spring-training games after ten innings. It also called for using spring training and the All-Star Game to test beginning every tenth inning with a runner on second base. Two-thirds of you are opposed, with the second-highest Passion Rating. Now, I can’t imagine you collectively care that much about spring training, or the All-Star Game. It’s the fear of the slippery slope — baseball would be trying this with the intention of later applying it to meaningful games. Maybe it would never actually get there. Collectively, you don’t want to even open the door a smidge. We hoped you liked reading Here’s What You Think About Those Proposed Changes to Baseball by Jeff Sullivan! I think it’d be interesting to see who was passionate about the universal DH. My hunch is that mostly NL fans are passionate about the issue, and that the majority of them oppose introducing the DH. If there are actually a lot of primarily AL fans who are passionate about imposing the DH on the NL, I would suggest that they find better things to care about. In my case, I’m passionate about there being one consistent rule across both leagues. I used to like the differences between the two leagues, but since interleague play came into being I think it’s high time to just settle on one set of rules. So lets get rid of interleague play. People tend to believe that most other people share their same beliefs and passions… and will attempt to rationalize away any evidence that it’s not the case. This describes me pretty well–I don’t like the DH and ideally, would like to see it abolished in the AL as well. Getting something for nothing is no fun, which is the DH rule (same reason why I think the “start on 2nd” rule in extra innings is so awful too). So I was very against it. That said, someone in the last article discussed an idea that would have a “pitcher-linked DH”–when the pitcher came out of the game, the DH would have to be replaced too. Now *that* is something I could get behind. The DH changes the game a lot. I mean, I think it is hard to defend a rule that says a player who is almost obligatorily horrible at hitting should hit. I think it makes no sense. But it is a very specific version of the game, and I think everybody should play by the same rules. Alternatively, why not allow the DH but make [an inane] rule where a position play HAS to pitch at least one inning of the game? If what’s interesting is seeing players do something they’re bad at, this seems more interesting than having all pitchers hit. I have an idea too – one random fielder is blindfolded in the 3rd, 6th, and 9th innings. The manager has the option to replace him with a player who can see, but then the blindfolded player can’t return to the game. Strategy! But wait, what is this? Machado is blindfolded. and now Wil Myers is coming to third while the third base coach and batter chat. Perfect response to the anti-DH “strategy” argument. We want to watch the best athletes in the world showcase the skills that they are best at. Adding pointless rules that do the opposite in the name of “strategy” is a terrible idea. I don’t watch baseball to see the “best athletes in the world showcase the skills”. I watch/play baseball to see the game itself executed efficiently. Baseball is a highly cerebral game that requires forethought & multiple levels of strategy. Baseball+DH is for morons who like mascots & fireworks. I’d rather see pitchers take their ABs than roll with some aging fatass that can’t even field a position. If players want ABs, then they must play a position on the field. Simple. For me, this. The DH is Little League, and it’s not about strategy to me. I made this point on the original post, but why should we stop at pitchers? Catchers stink at hitting. Give ’em a DH! 12 Catchers with at least 200 ABs were above league average according to wRC+. There were more (13) that were 30% worse than league average. Beyond batting futility, they can’t run the bases as a group at all. Only nine of 50 Catchers put up even a positive BsR, with only one (JT Realmuto) above 1.2. Mike Trout could just focus on hitting. What a world! He wouldn’t get hurt running into walls or sliding head first. You could have nine DR’s for your nine DH’s (but only one assigned per – that’s fair)! I’m for player value being based on the sum of their parts. I don’t want to paper over deficiencies. That’s fine, but my point was about the “strategy” argument, which you aren’t making. So there was no need to respond. I am fully aware that there is more than one potential for people to dislike the DH. If you like strategy, you should like rules that create meaningful strategy without diminishing the athleticism on the field. Otherwise you might as well support Jon’s facetious “blindfold” rule. If you are so interested in the best athletes doing the skills they are the best at, why not allow for designated fielders for those who can’t read the ball off the bat? Or designated runners for the slower batters. Then we can see 9 elite fielders AND 9 elite hitters every game, and there will be room on the rosters for people who can’t field or hit, they’re just SUPERDUPER FAST. Who doesn’t want to see a SUPERDUPERFAST guy running around the bases? Isn’t that what sports are all about? They are not obligated to be horrible hitters, and they weren’t always horrible. Go check out the Play Index on Baseball Reference and look at how pitchers hit in the late 60s and early 70s. Catfish Hunter hit .350 in 1971 in 103 ABs. Good for an OPS+ of 120. Eat your heart out Madison Bumgarner. The DH has created a self-fulfilling prophecy. If pitchers worked on hitting, they wouldn’t be horrible. We are well, well, well past the point where anyone can reasonably pretend that pitcher is “just another position” and “if they put in more practice, they would be competent hitters” and “it’s a self-fulfilling prophecy that pitchers are bad hitters!” No, they wouldn’t and no it’s not. Hitting requires elite physiological attributes and skills that a tiny percentage of humans have, and pitching requires a completely different set of elite physiological attributes and skills. There is no correlation between the two other than general athleticism. That you had to point to a single, 103-AB season as an exception proves my point. And no, this does not create a slippery slope argument to creating designated hitters for other positions as well, since the entire history of baseball has demonstrated that every position other than pitcher can be fielded by competent hitters. So everyone can get out of here with that nonsense. Yes, I agree that the cat is out of the bag. It doesn’t mean that I have to like it. I’m not saying that Pitcher is “just another position”, but not every spot in the lineup needs to be filled by a league average hitter. Just look at 80% of the regular Catchers in the league, or half of the SS, or many CFs. I do absolutely see pitchers’ inability to hit as a self-fulfilling prophecy. I gave one example, but there are of course many others in the years preceding the DH. Pitchers at one time could hit relatively competently, and some were even above league average (in small samples). And you’re making the slippery slope argument in your first paragraph. There is no correlation between batting ability and baserunning ability, or batting ability and defensive ability, other than “general athleticism”. We acknowledge these skills individually in how we calculate player value. Why should batters with “elite physiological attributes” be forced to work on aspects of their game which have no correlation to their ability to hit a baseball? Competence is relative. Catchers are more competent than Pitchers currently, but once Pitchers are removed from the pool, and they become the least competent (by far), maybe we’ll start asking the question as to whether or not they should have a DH too. We know the union would be all for it. Worse than that, they cannot run the bases at all as a group. Why make them? With some little research, I could probably make the argument that Catchers are relatively worse at baserunning than Pitchers are at hitting. Once they reach base they should be allowed to be replaced by free baserunners, softball style. Listen, I get it’s not going away in the AL. I get it’s coming in the NL. I don’t like it. And I hope that it doesn’t go any further, because, whether or not you buy the arguments today for expanding focused specialization, they very easily can be made. All we have to do is draw on the logic that brought us the DH in the first place. I put out the starter-linked DH idea as an alternative to the universal DH, partly because I’m not a fan of the DH overall. But the bigger reason for a starter-linked DH is slowing the trend of taking more and more innings away from starting pitchers, and giving them to a parade of hard-throwing, high-spin rate relievers. (3) rules being put in place to make it harder for pitchers (lower or more distant mound, smaller strike zone), which could worsen pitchers’ aging curve even more. There are other benefits to introducing the starter-linked DH, but preserving some career longevity for pitchers is the main one. I’m a high effort fantasy guy. I make a high ROI every single year, simply because I am logged on more than most. I Love the opener/bulk guy thing since it makes it nearly impossible for a guy with a 9-5 to compete. Lol, as a guy with a 9-5 (more like 7-6), it’s the logged-on guys like you that made me have to give up fantasy ball. Yeah, I’m definitely an NL guy… not a fan of the DH at all, but I could get behind the idea of linking the DH to the SPer. That may be an interesting way to deal with this on several levels. That would not only add some managing – if you don’t want to remove the DH, you might extend the SPer a batter or 2 longer than you would otherwise. But removing the SPer means you have to use another player to hit in the DH spot or bat the pitcher… all decisions that come into play. In addition, without having the DH to continue to bat for the P, that might be another element that limits the amount pitching changes we’d see even after the SPer comes out. But this combined with maybe a 2 batter minimum and a limit of 12 pitchers a team can carry on the active roster at any one time together might bring down the number of pitching changes in a game. Another alternative if you don’t want to remove the DH: you could move the DH to an on-field position right before you replace your SPer. From that point forward, pitchers would be scheduled to bat in the lineup spot of the position player who got pulled for the DH. For example, say the Red Sox have J.D. Martinez as the DH in the starting lineup. When they want to replace the starting pitcher, they could bring Martinez to play LF, and pull Benintendi. At that point, Benintendi’s spot in the lineup would be taken by the new relief pitcher. So it’s a tradeoff for the manager to weigh…Martinez’s bat and glove vs. Benintendi’s. I’m an NL fan and I’m passionate that there should be universal DH. Watching pitchers flail at the plate is one of my absolute least favorite things about seeing my team play. AL baseball is vastly more enjoyable. Point of view. In general, I like the strategies involved in navigating through the P slot. I dislike watching nearly every batter get on his heels and swing for the fences. I find the AL style to generally reflect that approach and I find the current version rather boring. Plus a few pitchers can handle themselves at the plate or have their bunting down which adds an extra differentiation when comparing their skill or game management strategy. Both leagues have similar hitters, I haven’t really noticed there being more “swing for the fences” guys in one league or the other. But while the Red Sox get to trot JD Martinez out there every game, I’m stuck watching a 2 out rally go hit-hit-IBB the 8th hitter-pitcher makes feeble contact or Ks to end the inning. It happens frequently and it’s dreadful to watch. I’ve long argued against expanding the DH. But recent pitcher-hitting performances (something like 125/143/148 last year) coupled with frequent pitching changes (far fewer actual strategic conundrums) changed the calculus for me. With the current minor leagues using the DH, its no surprise that the when rookie NL pitcher is called up they have such low batting avgs. Change that rule for the minor league clubs and we might see some increase in batting efficiency at the pitcher spot. Same initial hypothesis I had about the opposed vote representing a majority of that highly passionate group. I wonder how granular this data is. Is this something we can see? I would love to know. I’m more of an A.L. guy, but I feel very strongly that the National League should not adopt the Designated Hitter and I would prefer if the American League abolished it as well. I understand frustrations with pitchers flailing helplessly at the plate, but why shouldn’t that rationale also apply to poor hitting shortstops? Something about a guy who only comes off the bench to hit has always bugged me. If pitchers hitting is that much of a problem, I would prefer to go with eight man lineups that exclude the position entirely. Pitchers hit 125/143/148 last year. The best hitting pitcher (Bumgarner) last year had a wRC+ of 53. The worst hitting regular SS A Escobar) last year was at 60. Yeah, I think the characterization of pitchers as all flailing can be a bit overblown. Milwaukee gave a combined 138 plate appearances to Nate Orf and Eric Sogord. They hit .095 with .238 OPS and .134/.406 , respectively. In comparison, Suter hit .192/ .669 in 32 appearances. Chacin led MIlwaukee in PA for a pitcher and while he only hit .161/ .382 he also got 9 sacs in those appearances compared to Sogord+Orf’s 1. I pay to watch professional hitters face professional pitchers. I don’t pay to watch an amateur hitter face a professional pitcher. I’m an NL fan passionate about adding the DH. I dislike the DH, but I dislike the leagues being different more. I want them with the same rule set, and honestly, the benefit of “the strategy” is seldom relevant. It mostly just meas seeing free outs multiple times a game, and that’s boring. I was an AL fan (Twins) and have all sorts of rational arguments against pitchers batting, but I switched to an NL team (the Nats) 8 years ago and I can’t see going back to being a fan of an AL team—I just find the NL games so much more interesting. I think part of it is that I can’t really be a couch batter or pitcher, but I can be a couch manager, and there is so much more going on in an NL game from a manager’s perspective in a very true to the sport and authentic way. It’s also so much fun to see Max Scherzer try to pretend he’s not super happy and fail to play it cool every time he slaps a hit. His smile is so authentic and you can’t help but smile when you see him on first jawing it up with the firstbaseman as if he were a regular customer. Tbf Scherzer is an ok hitter by now. I’m 32 and I have been watching baseball since I was 5. I don’t honestly care about the DH either way, I think I voted against (Portland closest AL ), but what surprises me the most is people who are a fan of a league. Is that actually a thing? NL fans? AL Fans? I apologize if I am late to this. Maybe people in one-league-only fantasy leagues? I think it has more to do with “your team”. For example, A’s fans might be more in favor of a DH, while Cubs fans might be more in favor of no-DH—just because that’s what you’re used to. The Astros and the Brewers fans screw this all up because of the league-switching thing, but that’s what I think we’re alluding to. I’m an NL fan who doesn’t really like the DH. However, it’s pretty ridiculous to think *every* league in the world allows a designated hitter except *half* of one league. The DH is never going away. NL fans who don’t embrace it might as well just stop following baseball. It’s going to happen. Or, you know, follow the NPB Central league.